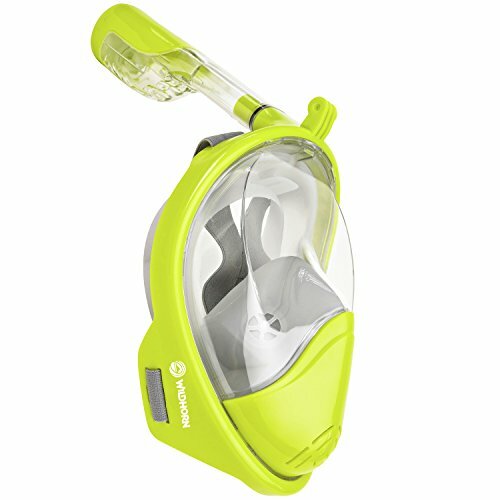 Wildhorn Outfitters has significantly updated the Seaview 180 Degrees mask with the release of the V2 version. The new model is so different and in our opinion so much better that we did a whole new review of this new version. 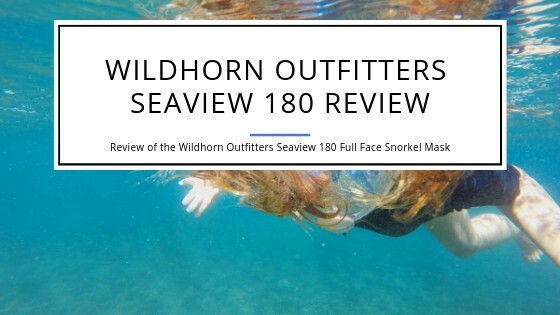 Check out the in-depth review at https://www.deepbluediving.org/wildhorn-outfitters-seaview-180-degree-v2-review/! 5.1 To shave or not? 7 How do you keep the Seaview 180 Degree clean? 9 What not to use the Seaview 180 for? 10 How does it fare against the rest? 11 Final Verdict â Is the Seaview 180 a good buy? 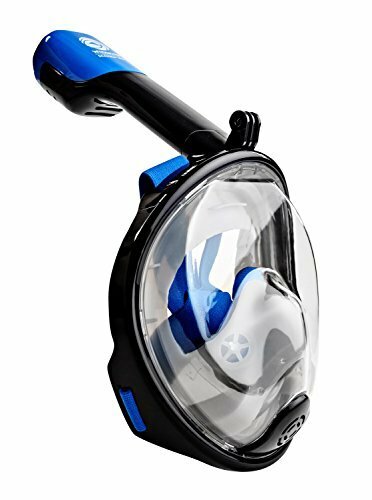 Looking at the full face snorkel goggles you get today makes you realize what a long way this recreational activity and its gear have come. These new masks are comfortable to wear, have a tight seal and most importantly allow you to see everything within a 180-degree field of view. One of those fantastic masks is the Wildhorn Outfitters Seaview 180Â°. Itâs one of the most sought-after goggles you can get today. The question you might have is whether there are good reasons why this is one of the most popular full face masks you can get today. The Seaview 180 is one of the overall best masks for snorkeling you can get. Itâs pretty much on par with the best goggles there are, the Tribord Subea Easybreath. Thereâs no question that the quality of material and of the build itself is top of the line. Excellent materials and build are not all thatâs important when youâre looking at any snorkel mask at all. There are some factors you have to consider when looking to find the best full face snorkeling mask for yourself. Similar to all full face snorkeling masks, you also donât have a mouthpiece with this mask. Nothing to clamp down and as such you can breathe freely through your mouth or your nose. This makes for a much more relaxed experience when snorkeling as you wonât end up with jaw fatigue from continually biting down on a mouthpiece as you have to do with a traditional mask and snorkel. Many people can snorkel for hours with goggles like the Seaview 180 degree while thatâs not possible when you use a snorkel with a mouthpiece. The most important of those factors is that the mask does its job. And that job is that it sits tight and comfortable and keep the water out. The Wildhorn Outfitters Seaview 180Â° does an excellent job when it comes to this specific task. But, keeping the water out is not just based on the quality of materials and the overall design but depends on how good of a match you find between the size of the mask and the size of your head. WildHorn has introduced a new XS size that targets specific people with small heads and children in addition to their other two sizes. This new XS size brings the overall number of sizes you can get up to three. Itâs a significant advantage to have a large number of different sizes to provide the best possible fit. 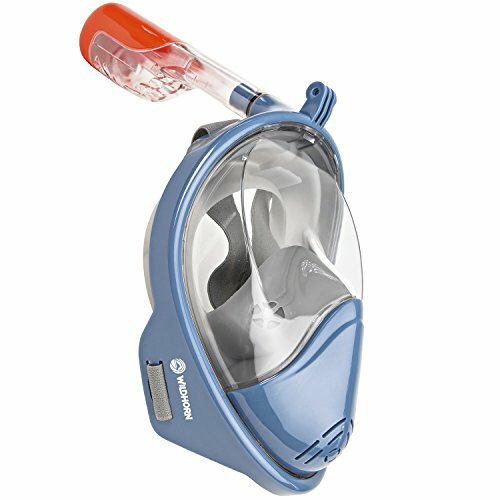 Other masks, like the Tribord Easybreath, offer only two different sizes. That typically is enough, but if you want to take your kids’ snorkeling, it can be that you wonât find a great match. The sizing of the Seaview 180 Degree is overall very simple. You measure the distance between the top (bridge) of your nose and the bottom of your chin while you have your mouth closed. If that distance is between 3.35 and 3.94 inches, then you need to get the XS size. This typically will fit a child. You need to go with the size S/M if the measurement is between 3.94 inches and 4.7 inches. This will most likely be the case for a woman or young adults/teenagers. Finally, if the measurement is above 4.7 inches then go for the L/XL size. Typically, thatâs the size that fits most men. The one thing you want to make sure when you put the mask on is that thereâs no gap between the goggles and your chin. This is where a wrong sitting mask typically will have a gap and water can get into it. If you have such a hole, then the goggles are too large, and you need one size smaller. One great thing of a full-face mask is that they are usually designed to direct the air around the lens, so thereâs no fogging. The WildHorn Outfitters Seaview 180 is doing exactly that, and it does that outstandingly good. 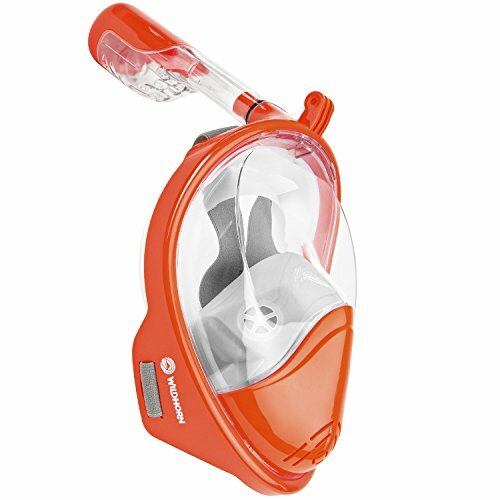 The overall mask design funnels the air you breath out in a way that the lens wonât get foggy. You keep a clear view in pretty much all conditions. Compared to the Easybreath it might be a smidge worse when it comes to its capability to keep the lens from getting foggy in all situations. However, for snorkeling in warm waters, you typically wonât run into any problems. Whether you need a GoPro mount or not mostly depends on whether you have a camera and want to use it when you go snorkeling. The Seaview 180Â° comes with an integrated mount on the top of the mask. The positioning is excellent as you will film what you see while the camera is entirely outside of your field of view. Camera mounts that clip on like on the Subea/Tribord Easybreath do a good job, but they do minimally obstruct your view. A fixed mounting point like on the Seaview mask can be put in an overall better location on the goggles. Itâs pretty apparent that the mask has to stay dry on the inside to allow you to have a great snorkeling experience. A mask consists of a hard (plastic) shell that has a soft rubber/silicone skirt attached which adheres to your face and produces a watertight seal. The skirt consists of some layers and in more complex masks, like high-end masks for scuba diving, the mix of silicone used can vary in the different sections of the skirt. A snorkel mask does not need that elaborate of a design as itâs used for snorkeling and wonât have to withstand the increasing pressure of the water around you when you dive down into the depth of the ocean or lake. The Seaview 180 Degree uses the top-of-the-line material for the skirt and produces a tight fit that keeps the water out. That only works if the mask has the right sizing for your head/face and is adjusted to sit tight and correctly. A skirt on any mask can only create a tight seal if there are no obstructions like hair or a beard. Even a strand of hair, which you would expect not to be a big issue, can prevent a watertight seal. Now, donât think that a strand of hair will allow the water to gush into your mask but it will let some water drip in. The same is true if you have a beard. A mustache poses no problem with the Seaview mask, but a full beard can be a problem. You most likely will experience some water from entering the goggles. However, the skirt is not the only place where water can enter the mask. The other area is the snorkel. In the old days, a snorkel consisted of a plastic tube with a rounded end and a rubber mouthpiece. You put the mouthpiece into your mouth and bit down on it to keep it in place. The plastic tube stayed above the water, and you were breathing through it. It worked great â in theory. The reality was that there are things like waves that splash water into the tube which then ends up in your mouth. When youâre not expecting it, and youâre trying to breathe in you end up with a load of water in your throat. The next thing is that you stick your head out and cough the water out. Overall, an enjoyable experience â NOT! This problem got solved with the introduction of dry snorkels. These have a floating device (often a ball) in the tip of the snorkel. When the snorkel gets under water, the float closes the snorkel, and it stays dry. This works great up to a point. As you can imagine, the float can only close the snorkel if you move the snorkel down into the water at the angle itâs designed for. So, if you dive straight down and the angle of the snorkel prevents the float from closing it, you still end up with water in your mouth/mask. That is true for all dry snorkels whether they are traditional snorkels or integrated into a full-face mask. The Wildhorn Outfitters Seaview 180Â° uses this technology to have an integrated dry snorkel. As long as you use the mask for snorkeling and for an occasional underwater dive where your head stays in a similar position as when you snorkel, youâll keep dry in the goggles. In any case, if you should have some water inside the mask, then the Seaview has you covered. You lift your head above the water and tilt it back. This will open the drainage valve at the bottom of the mask, and the water will escape that way. Super easy and useful to keep your snorkeling trip enjoyable! How do you keep the Seaview 180 Degree clean? Thereâs honestly not much you have to worry about. Rinsing the mask with clean water after each snorkel excursion is usually enough. Make sure that you do a good rinse and that you wash out all areas of the goggles. Masks like these are not designed to be washed in your laundry machine or your dishwasher. Doing so will damage the mask! Store the goggles in a breathable (mesh) bag. As it is made from plastics, you want to store it out of direct sunlight. The UV rays of sunlight can and will over time have a negative impact on any plastic and silicone and damage the mask. If youâre taking the mask with you to the beach, then make sure that you rest it with the visor facing up. This way the rough surface will not scratch the lens! It can also happen that sand or dirt enter the tip of the snorkel. Over time this can stop the float valve/mechanism from working correctly. Make sure that you always rinse the snorkel together with the rest of the mask with fresh water to wash out any debris. Since the latest update of the mask by its manufacturer WildHorn Outfitters, you can choose from a large variety of colors. At last count, there were up to 10 different colors to pick from. So, no matter what color your bathing suit, you can find a matching mask! The only exception is the XS size which seems to only come in the Navy color at this time. Otherwise, go for your favorite color and enjoy the underwater world! What not to use the Seaview 180 for? These types of masks are designed for recreational snorkeling. That statement alone should make it clear that there are some limitations on what to use such a full-face snorkel mask for. First, itâs not a good fit if you want to use it for freediving or any other sort of activity where youâre more underwater than on the water. The volume of the mask traps a lot of air and makes it harder and eventually quite uncomfortable to dive down to more than 10 feet or so. These masks are also not designed to be used in rough waters. The snorkel is dry to some extent, but rough seas and waves will create tilts and gushes that will let water enter through the snorkel. Final Verdict â Is the Seaview 180 a good buy? 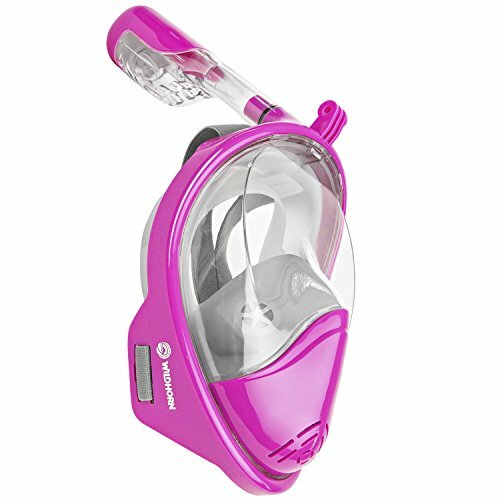 Without a doubt, the Seaview 180Â° is a great mask for anyone in your family. It will open a whole new world underwater when you start to snorkel with it. While it might look somewhat challenging to put on, itâs quite easy to do. You merely place the mask on your face from the front and then get the straps over your head. The straps are designed so they wonât get caught in your hair. Once you have it on your face, itâs very comfortable to wear for hours at a time. Being able to breath comfortably makes it an excellent fit for anyone in your family. Enjoy snorkeling with your kids while they can explore the wonders underwater! Just make sure you get the correct size for everyone, and youâre good to go!